Yu Aoi for new Yoji Yamada Tokyo Kazoku Film | personal.amy-wong.com - A Blog by Amy Wong. Yoji Yamada was working on a new project based on the re-telling of beloved film Tokyo Story, which will be called Tokyo Kazoku (Tokyo Family). The cast has been announced as Bunta Sugawara, Etsuko Ichihara, Masashiko Nishimura, Yui Natsukawa, Shigeru Muroi, Shozo Hayashiya, Satoshi Tsumabuki and Yu Aoi. 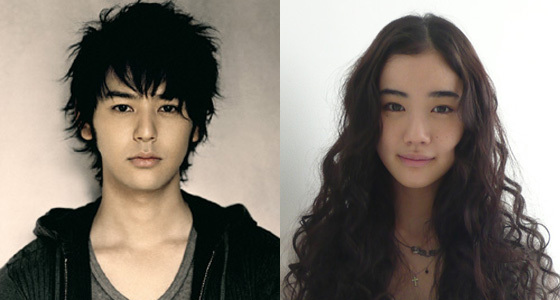 Satoshi Tsumabuki (30) will play the younger son, with Yu Aoi (25) playing his girlfriend. I know the reviews for About Her Brother, aka. Otouto, weren’t glowing, but I’m still giddy over the fact that Yoji Yamada decided to call Yu-chan once again. That must mean she’s a professional, and that people want to work with her more than once, right? Shooting of Tokyo Kazoku starts on April 1st until late June, with a possible release (in Japan) by the end of the year… most likely early next year. "I know the reviews for About Her Brother aka. Otouto, weren’t glowing". Sometimes critics run behind audiences but I've read some great reviews from US and French critics. What is sad is that some Japanese reviewers proved to be totally unable to see how much this very good film pays tribute to old masters like Yasujirou Ozu. I’m glad high caliber directors like Yamada and Iwai enjoy working with Yu. I can’t say I’m surprised though. From watching various “behind the scenes” clips from her films, anyone can see that she has a great work ethic (Making of H&A – final ballet scene),gets along with everybody, and has the will power to sacrifice for a role (Welcome to the Quiet Room). Now if only other quality directors would take notice…cough cough Mr. Koreeda, Mr. Nakashima! But would certainly LOVE Koreeda. I think Yu could do a lot with Koreeda’s silent moments in his films. But at the moment, I really can’t wait for Vampire. Or in any case, Raiou. LOL I want to see a whole movie with Yu starring in it. woosh, a movie for KoreEda or Nakashima would be awesome. Btw has anyone seen Sweet little lies with Miki? Quite good and she’s her usual fabulous thespian !!! @nill, I haven’t seen Sweet Little Lies, but I’ve heard great things. It’s directed by Hitoshi Yazaki who also directed one of my favorite japanese films, “Strawberry Shortcakes”. I would love to see Yu work with him someday. @Amy, I know what you mean about Nakashima, but wouldn’t it be worth it to see “Funny Yu” come out again? Remember “Turtles Swim Faster Than Expected”? Picture that combined with Nakashima! Also, Nakashima was able to get the best out of Nakatani. I haven’t seen a film where she’s acted better. BTW, Yamada’s retelling of Tokyo Story will be great for Yu’s career. Alot of people in Japan are going to see it since the original is so beloved there. It could open a few new doors for her. Hopefully her role is big enough so that she could contend for a Best Supporting Actress award. I watched Otouto recently (not just because of Yuu, of course :D I’ve heard about Yamada Yoji for quite a long time but had yet to see any of his films prior to Otouto), and to be honest, I didn’t like it at all. While there were quite a few touching scenes, I feel like it was overly done on the dramatic stuff, everything was just too sentimental, and it’s not the subtlety that I’ve always enjoyed in finest Japanese cinemas. Other than Otouto, I haven’t watched others of Yamada films’, but after Otouto I’m a little hesitant about the remake of Tokyo Story. That being said, I’m still happy Yuu got picked again, and I’ll of course watch the film when it comes out :D. BUT, I want to see her in another main role soon, in a movie of the same quality as Hana & Alice (or One million yen girl kind of film would be nice too). @HHND, can’t really fight you that much. I do like melodrama though. Yoji Yamada’s Tokyo Kazoku ON!